Dessert Ice cream. The salty pimp. I heard about this place through my friend, who said that the truck made its way through Los Angeles sometime late last year. The idea was fascinating. First off, the idea of getting ice cream from a truck rather than a refrigerator sends me back to the good ol’ days when my mother thought the ice cream truck was just another method that kidnappers used to attract kids (it still could be?). To some extent, a food truck is a little less creepy than an old guy in a singing vehicle, but let’s not go there. Unfortunately for the Big Gay Ice Cream truck, I didn’t get the opportunity to check them out while I was in Los Angeles. I don’t think it was very high on my priority list back then. The entire notion sounded a little out of the box, however the title of the establishment itself deserved a thorough visit. Luckily, there was the original brick and mortar in New York City (where I currently was). A friend of mine was attending medical school in New York, so I dragged him along; he was appalled that I even wanted to eat continue eating after three dinners. I wanted to see what the hype was all about, since it had been quite some time that this “ice cream truck” business was hanging above my head. 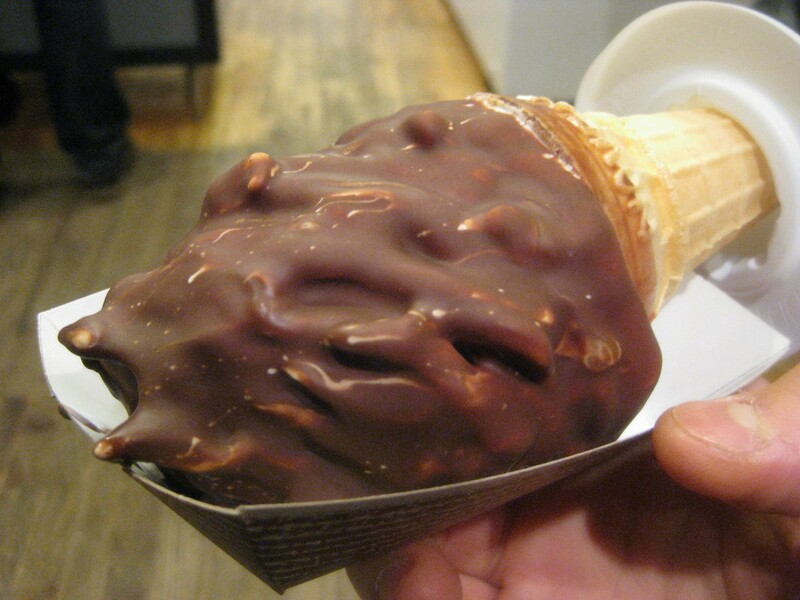 The “salty pimp” was salted caramel ice cream with a chocolate shell inside a waffle cone, served up big-as-your-fist style with a fork, which immediately conveyed the fact that it was probably going to be messy. There were supposed to be swirls of sea-salt caramel in the ice cream but I didn’t taste it at all. My first bite of the “ice cream” made me think soft serve, which was odd, since it was marketed as an ice cream. The soft serve (I think) was nothing special and the chocolate wasn’t terribly unique either. Even the salted caramel was sort of missing (the part that I was most excited for). The cone wasn’t very appetizing either. I’m not quite sure why I still ate it. (I guess there’s always room for dessert). Disregarding the fact that I still didn’t quite enjoy the salty pimp, I wouldn’t discard Big Gay Ice Cream just yet. They have an enthusiastic base of ice cream lovers behind them, and I only tried them once. I won’t be returning for the salty pimp, but most likely will be returning to try some of their other flavors. Still, there still was science behind the madness. 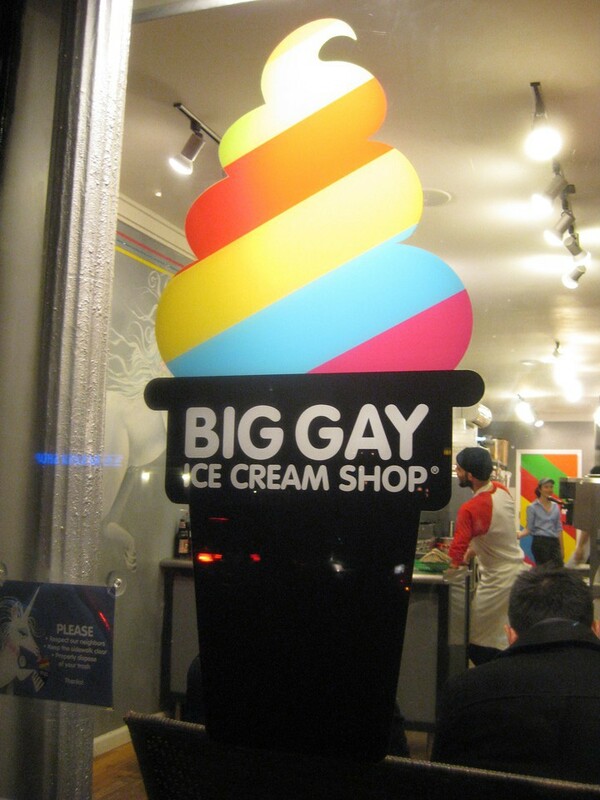 It was sort of ironic that the first thing I tried at Big Gay ICE CREAM was something akin to SOFT SERVE. I want to say it tasted like, felt like, and certainly looked like soft serve, but I could have been wrong. Softer ice cream, in this case, is made by the introduction of additional air while freezing (it’s easier to manipulate air, hence, soft serve being more malleable). In addition to this, soft serve is made and stored around -4 degrees Celsius, compared to the -15 degrees Celsius or so that normal ice cream is stored at. Because of the increased air content, the ice cream takes on a lighter color, which can either be as a result of increased air or the addition of food coloring. Even if the taste of the salty pimp wasn’t great, I would have preferred a firmer texture for cold treats. Near the end, I felt like I was scooping ice cream goop out of a paper plate that was just about to disintegrate under the weight of melted liquid. Maybe I would have liked it better if I left it to melt and refreeze again, without all the extra air. Reconstituted soft serve striving to be ice cream for breakfast? How about this? Mcgee, Harold. On Food and Cooking. 2008. epub Edition. Collins, Dan. KIKN 100.5 Sioux Falls. Walmart Ice Cream Tester.